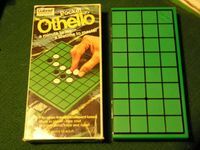 Green plastic board with a raised black lined 8x8 grid. Measures 8"x4"x1" when folded and 8"x8"x.5" when unfolded. 2 three row trays (one for each player) are kept inside the game box when closed and hold 32 discs in each tray. Discs are .5" in diameter by 1/8" thick. The discs are made of two pieces of plastic that snap together to form the black/white discs.